To unite, assist, and continuously improve all Entomology Scent Detection Canine Teams. To establish a working standard for all Entomology Scent Detecting Canines, Handlers, and Trainers through an accredited program. To improve the image of Entomology Scent Detecting Canine. Regular Members – Full membership in this association shall be open to any person/s actively involved in the pest control industry, any Entomology Scent Detection Handler, and/or Trainer, and any employee of a state or federal pest control governing authority with working Entomology Scent Detection Teams certified with NESDCA. If a company or agency pays for the member’s membership dues, the company or agency has the right to reassign that membership to another qualifying person anytime during that dues period. The change in membership by the company or agency must be in writing to the Secretary. The written change will include the current member’s complete information and the new replacement person’s complete information on a NESDCA membership application. No one shall receive any salary or compensation for services rendered to the Association. However, out of pocket expenses incurred reasonably and necessarily may be reimbursed while conducting the affairs of the Association. The Executive Board consists of the elected NESDCA officers. It shall be the duty of the President to call and preside at all regular and special meetings. He/she shall see that the Bylaws and all Rules and Regulations are respected and obeyed. He/she shall cast the deciding vote in case of a tie. He/she shall appoint committees and may designate their Chairperson. He/she shall perform such other duties as are usual and incidental to the office of President. He/she is a member ex-officio of all committees except the Election Committee. The Vice President shall actively assist and support the President in his/her duties, and shall be the President pro-tempore in the absence of the President, during which time the Vice President shall assume all the duties and responsibilities of that office. He/she shall be required to attend, with the President, all hearings, committee meetings, conferences, etc., to which the President is required or expected, in the interest of and or on behalf of the membership of this Association in order that he/she may be as informed of all matters concerning the Association as is the President. It shall be the duty of the Secretary to accurately record the proceeding at meetings. He/she shall call the roll of Officers and note absentees. He/she shall communicate and correspond with all persons and organizations both within and outside the association relative to Executive Board business. He/she shall receive all moneys in the absence of the Treasurer. He/she shall be responsible to maintain all certification records for each certified or re-certified Entomology Scent Detection Canine Teams. It shall be the duty of the Treasurer to collect all moneys due to this association, giving receipt thereof. He/she shall keep a suitable set of book of record. He/she shall deposit all moneys of this Association in a bank designated by the Executive Board. He/she shall draw all checks or other obligations authorized by the Executive Board, and attested to by the Secretary, including payments of all benefits. The account books as well as all papers in his/her custody shall be open for inspection and examination by the Executive Board. He/she shall not lend or invest any of the funds except when duly authorized by the Executive Board. The Certification / K-9 Chairperson will be an appointed position who shall serve as an advisor to the Executive Board. They will have at least 10 years of K-9 experience, and must have been a qualified NESDCA trainer or Evaluator. The Certification / K-9 Chairperson can not evaluate while holding this position. Their duties will include but not limited too keeping records of applications, certifications, complaints, disputes, K-9 related standards and status of Evaluators, Trainers, Handlers, K-9’s and Facilities. Any and all issues involving the list above will be given to the Certification Chairperson who will investigate and/or settle at his or her discretion. They shall report their findings to the Executive Board along with recommendations. He/she will review all request for trainers or evaluators and approve or disprove their request. They, or an appointed designee, are responsible to ensure that all standards involving all K-9 related aspects of NESDCA are adhered too. Section A: All candidates for office shall be nominated at the General Membership meeting at the National Training Workshop. Section B: A majority vote shall elect each position. Members are to be notified as soon as possible. Section C: Newly elected Officers shall take office 30 days after date of official election. Section D: Election of Officers will be held every two (2) years. A quorum shall consist of the majority of the Executive Board present. All Executive Board members shall be notified adequately in advance as to any and all meetings. All proposed changes must be submitted in writing to the Executive Board. The Executive Board shall review and present a final proposed change to By Laws at the Executive Board meeting. Regardless, if any amendment, addition or deletion is passed unanimously, it shall be null and void if it is in direct conflict with the Articles of Incorporation. The yearly dues of the Association for a regular member will be $225.00 plus $110.00 for each additional team after the initial team included in the membership dues. If a membership fee is not renewed within 15 days after current membership has passed the members NESDCA status will be listed as “Certification Expired” and that team may not present themselves as NESDCA Certified. A $30.00 service charge will be assessed for any bad/bounced check, no matter what the reason for it being dishonored. In addition any paperwork, such as certifications, is suspended until the check is made good. never hold any Office in the Association. NESDCA’s name and logo’s may be utilized by any Regular member Scent Detection Team in good standing. 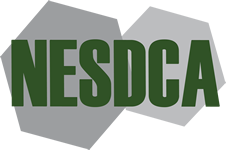 Anyone whose membership and/or annual re-certification has expired may not represent or advertise utilizing NESDCA’s name or logo’s until they restore their membership to an updated and current status or pass an annual re-certification. Section A: The application for membership shall provide that the applicant, agrees to abide by these By Laws and all Rules adopted by the Executive Board. He/she further agrees to abide by the Code of Ethics. Section B: No member will act in a manner prejudicial to the Association or its members. No member will knowingly falsify or misrepresent any record or document in connection with the certification, sale, or representation of a dog. Section C: Any member in good standing may prefer charges against any other member for alleged conduct in violation of the Code of Ethics. Such charges must be in writing, signed by the complainant, setting forth the facts upon which the charges are based in a concise and summary manner, and shall be filed with the Executive Board. The complainant must agree to appear and furnish full evidence in support of the charges if requested to do so. The Executive Board will then proceed as described in Article 9. Section D: Disciplinary action may include the temporary suspension of privileges, censure, expulsion or any other action deemed appropriate by the Executive Board. Section E: If the Executive Board finds that a member in preferring charges against another member did so for spurious reasons, out of improper motives, and if the charges are wholly false and without proper foundation, then the Executive Board may, if it desires, take appropriate disciplinary action against the complainant. Section F: No disciplinary action shall be taken against a member, be he/she the complainant or accused, unless the member shall have been afforded the opportunity of a hearing before the Executive Board. Section G: Every member shall be presumed innocent of misconduct, and disciplinary action shall be taken against a member only if he/she is found guilty of misconduct from evidence found true by the Executive Board. Section H: Any member who is found guilty by the Executive Board of any violations of NESDCA Bylaws and/or Rules and Regulations, shall have a maximum of thirty (30) calendar days from the date of his/her written notification, to file a written appeal of the findings and punishment to the NESDCA Certification / K-9 Chairperson for their consideration. Said appeal will be forwarded to the NESDCA Secretary. THE REST OF THIS PAGE LEFT BLANK INTENTIONALLY.